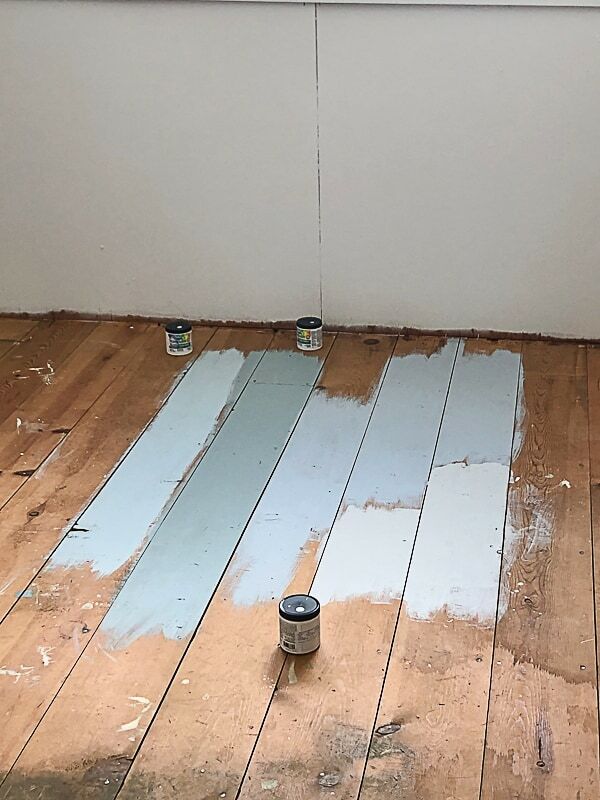 I am so happy with this paint for wood floors and I can’t wait to share this project with you! 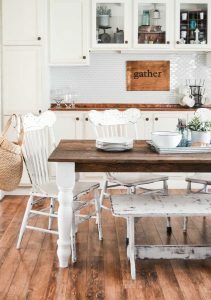 We are plugging away at our fourth flip house (see all the before photos and video tour of the house HERE) and finishing projects left and right. If you are following along with me on Facebook HERE and Instagram HERE, you are seeing the entire flip project enfold as we do it. We started working on the mail level and taking carpet and everything that was left in the house out. There was a lot of cleaning that had to take place before we could move forward, but once all the walls were clean, we started painting the main level. Once that was done, we started tackling the two bedrooms upstairs. 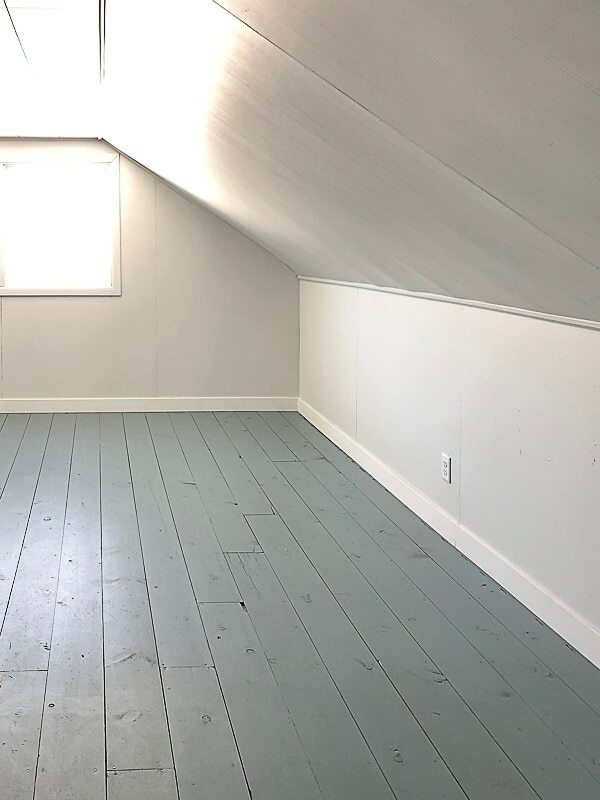 Here is a photo of the bedroom I am going to talk about in this post on the day we bought the house. Both of the upstairs bedrooms were dark and depressing when we bought the house. 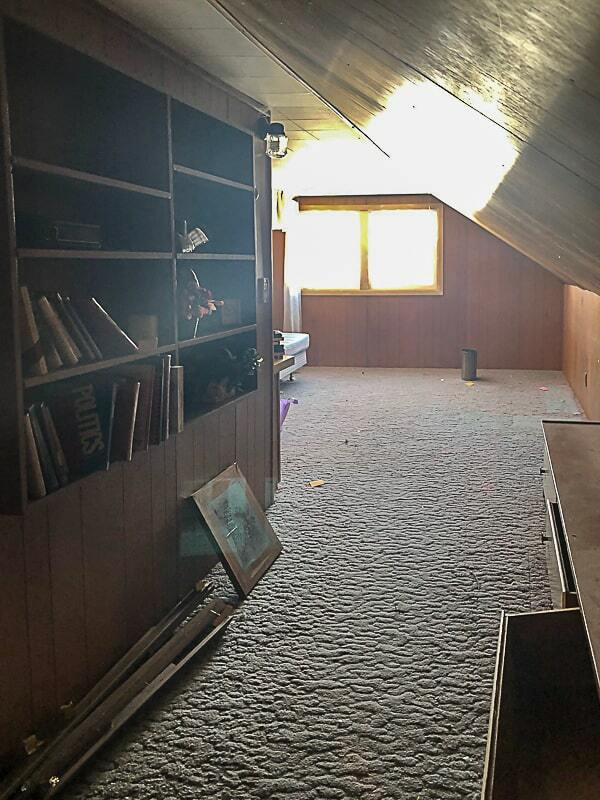 They were covered in dark paneling and the carpet looked original to the house. Once we got the room cleaned out and I washed all of the paneled walls, we painted the walls. 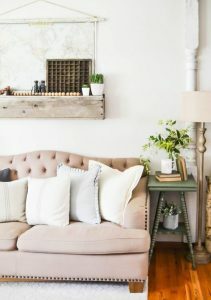 I have shared all about painting paneled walls in my post HERE so I won’t spend time share that in the post. Make sure to head over to that post if you have questions about painting paneled walls. Once we had the walls painted, it was time to take the nasty carpet out of the room. When I started pulling the carpet away from one corner, I couldn’t believe what I found underneath! 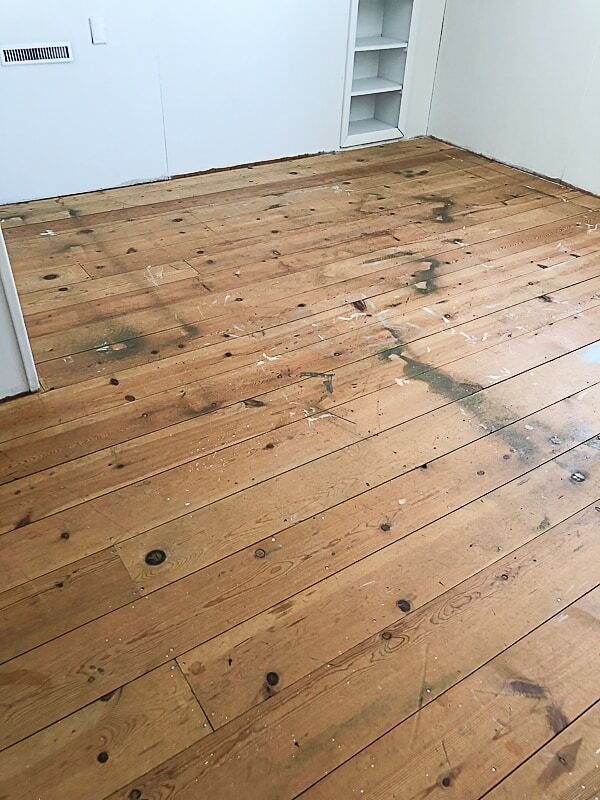 I found wide planked floors under the carpet in this bedroom!!! I started yelling and Matt thought something was really wrong. He rushed upstairs and his jaw dropped when he saw what I had discovered. We started tearing up all of the carpet to see what the rest of the floors looked like. They were in great shape, but there was some paint and stain splatters on some of it. 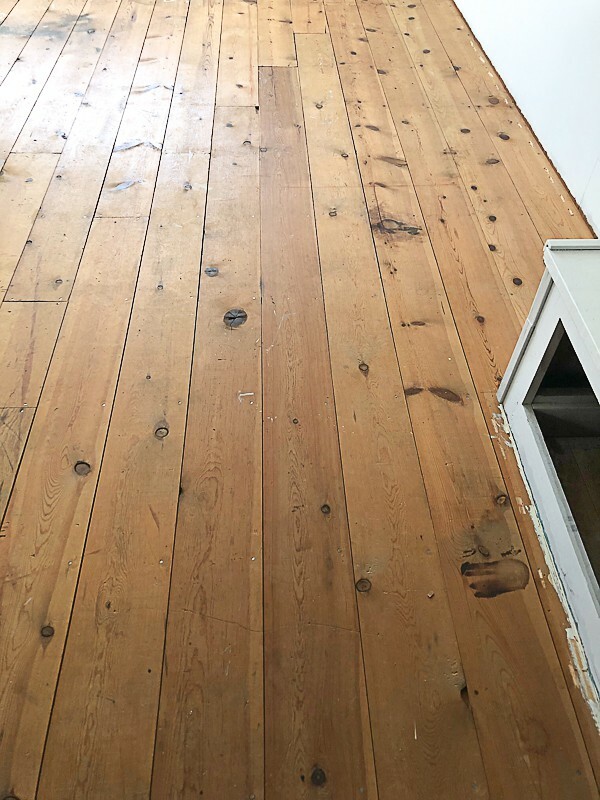 When we pulled up the carpet on the main level, we found beautiful hardwood floors underneath. We decided that we were going to hire someone to come in and sand and finish those floors. I didn’t want to spend that money in this bedroom and I knew I didn’t want to cover up the floors with carpet. Matt and I knew right away that we were going to paint these floors! 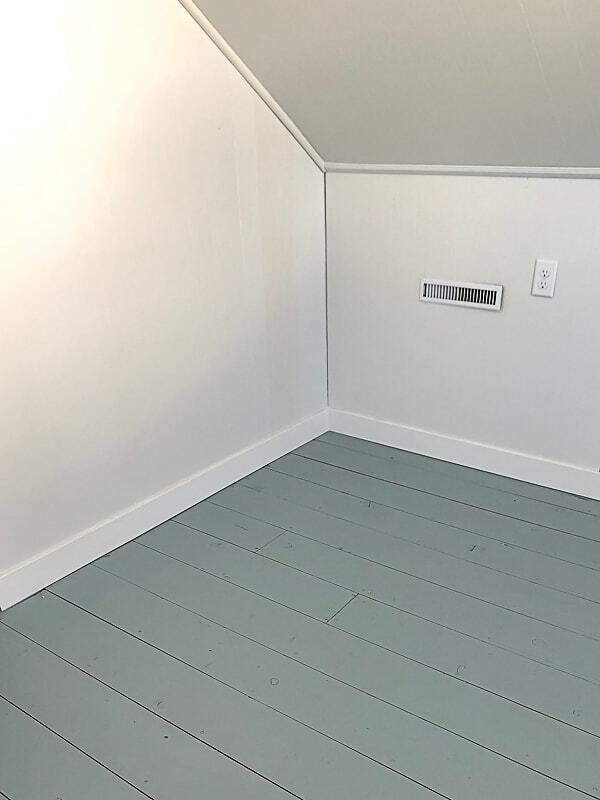 We have always wanted to find a project where we could paint floors like this and we never thought, in a million years, that it would be in this flip house. 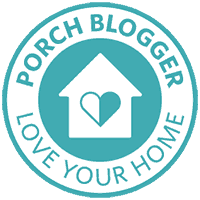 I am giddy again writing this post! It was that exciting for me. To prep the floors for paint, we vacuumed and cleaned them. We also went along each board and made sure the nails were down. Once that was all done, it was time for paint. I went to our local Menards store and picked out a few different paint colors from Dutch Boy Paints. I wanted to keep the room bright and airy, but still fun. 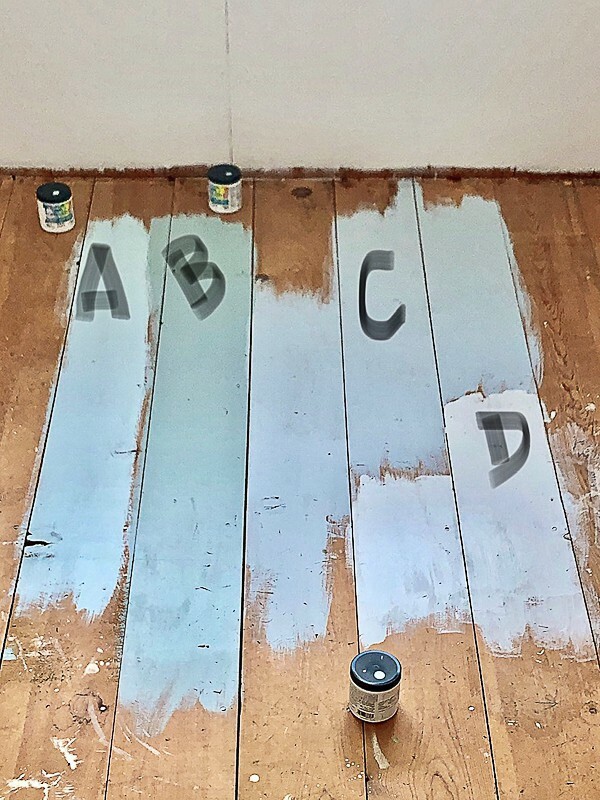 I put the different paint colors on the floor and knew right away which one was my favorite. I thought it would be fun to share the colors on my Instagram page and Facebook page to get people to vote on the colors. The vote was different on each platform. The vote on Instagram was definitely “B”, but Facebook was all over the map with their votes. I knew right away that I wanted to use the color “B” when I put it on the floor. It was so pretty and would still keep the room light. 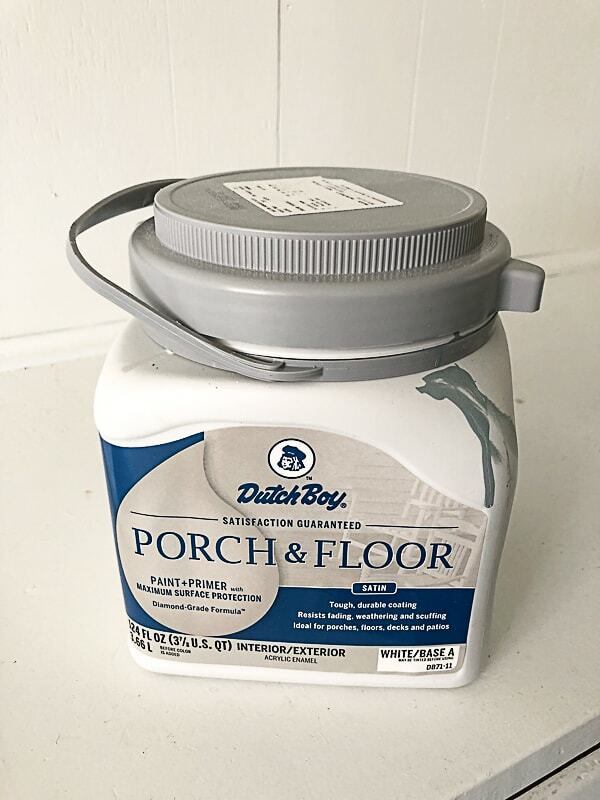 We chose the Dutch Boy Porch & Floor paint for the paint for wood floors. The color is called, “Grayed Foundry”. 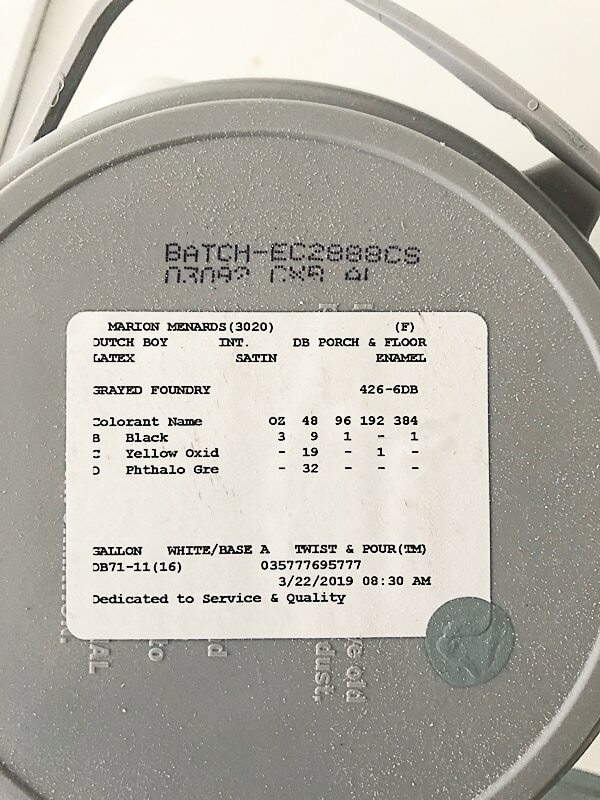 I took a photo of the lid of the paint in case you want to get the same color for a project. When I opened the paint to trim the floors, I thought there was something wrong with the paint. It was so thin!!! I thought porch and floor paint would be thicker to stand up to wear, but this was thin. When I put it on the floor, it covered so well, so I just continued on. Once I had the floor trimmed, I waited for Matt to roll the rest of it to see how it covered. As soon as he poured the paint, he said, “This paint is really thin!”. 🙂 He had the same thoughts so I knew I wasn’t going crazy. He started rolling the floor and the paint covered it in one coat. I am not kidding! I had to do some touch up around the trim, but we had the room done in one coat. When the paint was dry, Matt added trim all around the base of the room. After he was done, he said that if we were going to live in this house, he would want this to be our room because of the painted floor alone. I love this man. I couldn’t be more happy with the color and I love how bright and happy this room is now. It has come a long way from when we bought the house. 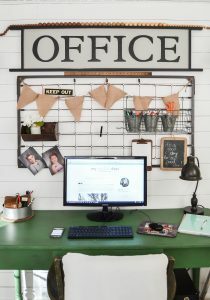 I see this room being a bedroom for anyone in a family or even a creative space or an office. It is just beautiful and a space you would want to spend a lot of time in. That was my goal. I wanted to flip this room and take it from a dark dungeon and a place you didn’t want to be and transform it into a bright and happy place that you wouldn’t want to leave. We accomplished that goal and I am so proud of it. We added a big chalkboard and painted out the bench in the room as you walk into it. It is just going to be a fun space for the new home owners. I am sure of it. If you have wood floors that you would like to paint, I would say go for it. 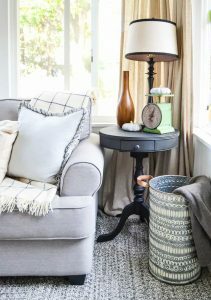 We loved the Dutch Boy paint for wood floors that we picked out and would recommend it to anyone else who is doing the same project. 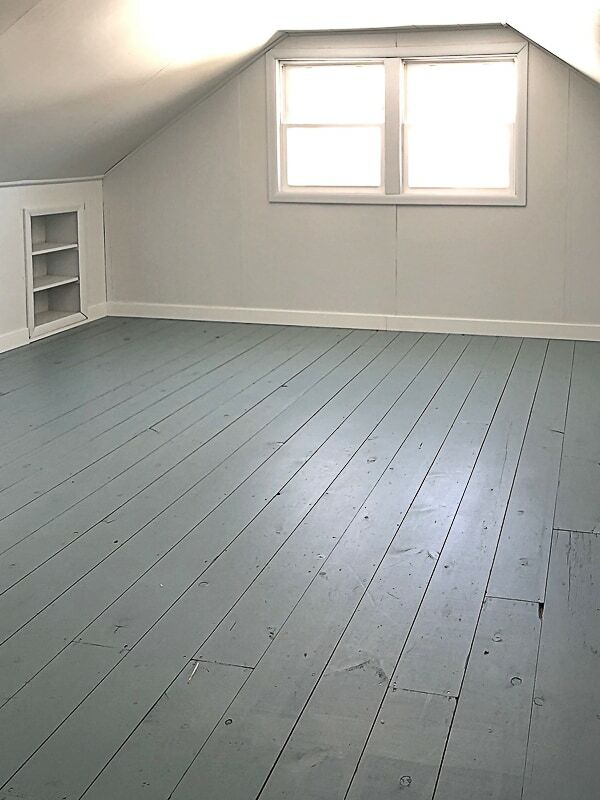 Tell me, have you ever painted wood floors? What color did you chose? 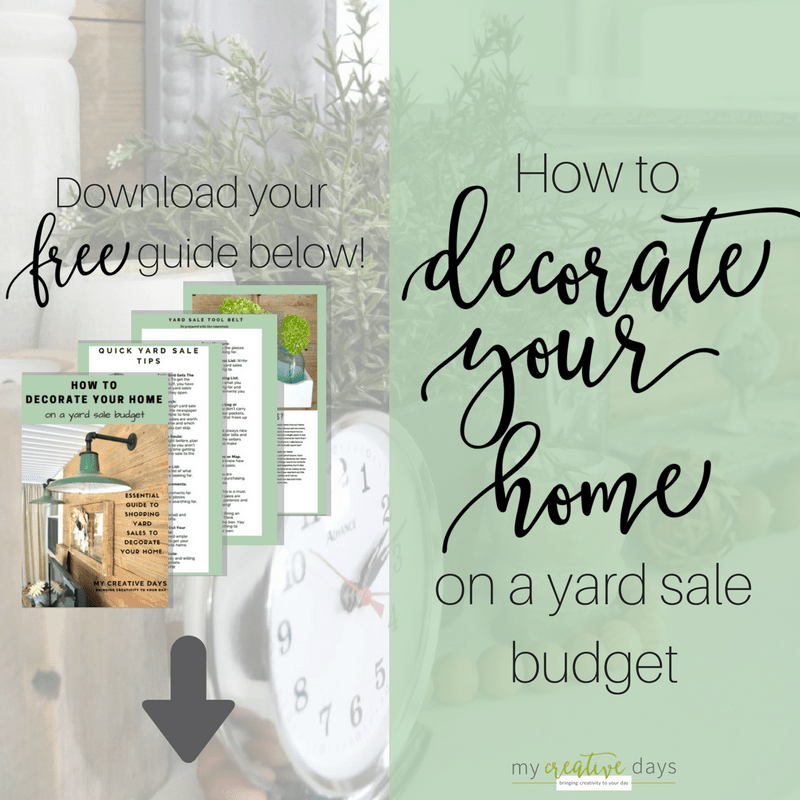 How To Paint A Bathtub Easily & Inexpensively! 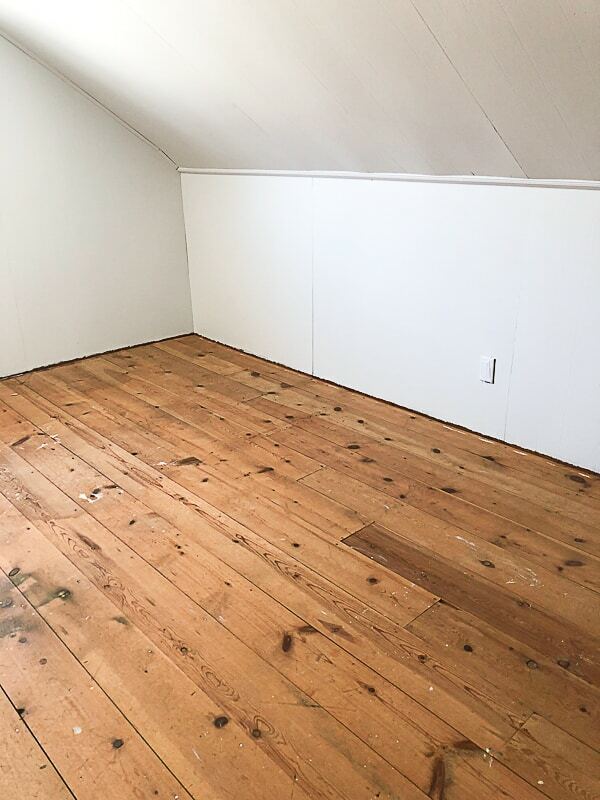 My aunt painted all of the floors in her cabin and found that if you wax them they were way more durable. I think she used vinyl floor wax. I know this is just a flip house, but it may be something to keep in mind if you notice they are starting to get scuffed. It looks really good! Thanks for the tip Dee! Love that room! I’m going to copy it as the shape is like one of mine. It will be my yoga room. I love how this floor turned out! It looks like a paint wash because you can still see the grain through the color and I just love the color! You are right this room is soooo happy now! Excellent job!!! Looks great! That’s the color I liked best, too.